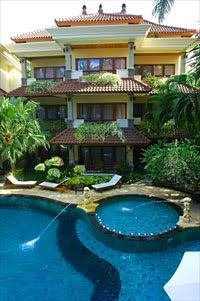 Parigata Resort N Spa, Sanur - Bali is located on the coastal fringe of Sanur’s seaside village. Enjoy Bali’s tropical sunshine at the poolside or wander down to the Beach Club for sea breezes. Enjoy the local water sports or simply relax in a lounge chair with a cocktail and a good book.A living room-style lounge, open from 10.00am-01.00am with a waterfall backdrop overlooking a fountain aquarium, features live piano music and cocktail from 06.00pm. The Flamboyant Restaurant at the poolside an open-air indoor-outdoor dining room serves Indonesian & international fares round the clock.Our Spa offers a full service salon and spa menu. With massage, body scrub and facial treatments.Meeting facility for up to 50, a boutique and well-stocked gift shop/drugstore complete the resort facilities. This relaxing oasis tucked away in the exclusive Batu Jimbar estate, home of the jet set, rich and famous is hidden gem for Sanur’s crown.